Here is one more Government job opportunity for Engineering graduates and diploma Holder candidates. Government jobs in Punjab Water Supply & Sanitation Department for Jr. Engineer candidates. 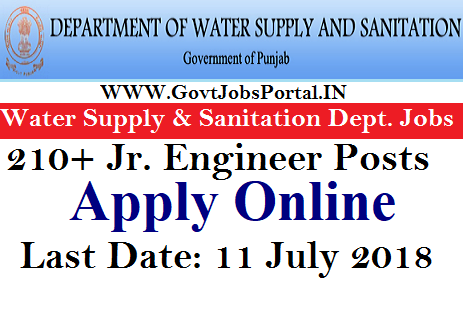 Punjab water Supply department issued an official notification on their official website related to this recruitment process for filling up 210+ vacant positions of Jr. Engineers. Candidates who completed their study in Civil, Mechanical and Electrical trade can apply for these Government jobs in Punjab state. There is only online process for applying these Government jobs for Engineers. Department is not going to accept any other mode of the application form. Just apply online through the official website only. Complete information detail step by step is given below in this article. Read the whole article carefully before applying these Government jobs in Punjab. Number of Vacancies: 199 Posts. Pay Band: Rs.10300-34800 + the Grade Pay of Rs. 4800. Number of Vacancies: 11 posts. Section2: What is the eligibility Criteria for applying these Govt jobs in Punjab? Education: Those who possess a three years* Diploma in Civil Engineering /Mech. / Electrical or its equivalent/ higher qualification that means Degree in the same stream from a well renowned university of India or any other equivalent can apply for these Government jobs in Punjab state. Age Bond: The candidates who are wishing to apply these Govt jobs in Punjab must fall in the following age group of 18-37 years. Section-3: What Application Fee to be paid for applying these Government jobs? The candidates belonging to the Reserved Category that is from the following casts: “SC/ST/BC/PWD” has to pay Rs.500 as their application fee for applying this recruitment process. While all other Category candidates have to pay Rs. 1000 are their exam fee. You can pay the application fee through online process also. Read the official PDF file carefully for more detail. Section-4: How we can apply for these jobs in Water Supply Department? Those who are wishing to apply these jobs in Punjab state can apply online through the official website. We also share the direct link as well as the reference link from which we took this information below under IMPORTANT LINK section. The process for applying these Government jobs in Punjab will be start on 16th June 2018 and will expire on 11th July 2018. All of you have to apply between these dates. 16th June 2018 is the Starting Date to apply Online. 11th July 2018 is the Last Date to apply.